Last Thursday evening I met up with Yozza, another resident of the eternally-just-unwrapped city of Perth, Western Australia, who has a wood-fired oven at his workplace. After some PM exchanges during which I expressed in pining tones that I would love to try baking my sourdough pizzas in a WFO, Yozza suggested a bake-off: he would bake some of his dark ale wholemeal/white bread with molasses and sprouted wheat, and I would bring along some SD pizza dough and toppings. I’d learned through our PM correspondence that Yozza is a pro baker who has sensibly elected to extricate himself from the long hours and pressures of baking for a living, and who now has things very well worked out – he works on campus at a technical college in a non-baking capacity, but spends whatever time he has spare haunting the Hospitality and Commercial Cooking section, where he is able to keep in contact with baking in a commercial context, while contributing his knowledge and experience to the staff and students…not to mention his bread, which he hides in secret spots on site, lest it disappear before he can make good his promises of a loaf or three to multiple grateful staff members, with a couple in reserve to take home! I’d never met Yozza in person until last Thursday, but I would have had no trouble picking him out of a line-up – he looks exactly as I imagine a baker should look! I’m not going to elaborate unless specifically pushed…but if your image of The Baker archetype equates with mine, there is really no need! Yozza led me through a warren of rooms and corridors to a courtyard outside the Hospitality student restaurant, where a handsome wood fired oven takes pride of place. 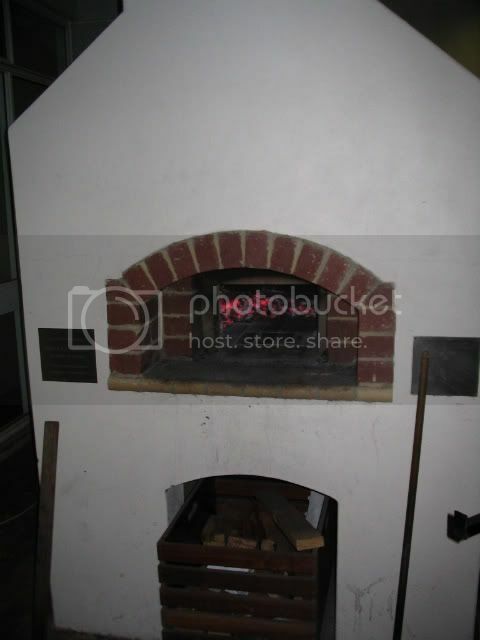 Yozza is justly proud of the oven; it was his brainchild, built by the college’s engineering students. He had fired it up earlier in the day, ready for our bake-off. It glowed beautifully from within, radiating the ancient heat of the baking ages and the promise of the pizzas and bread to come. 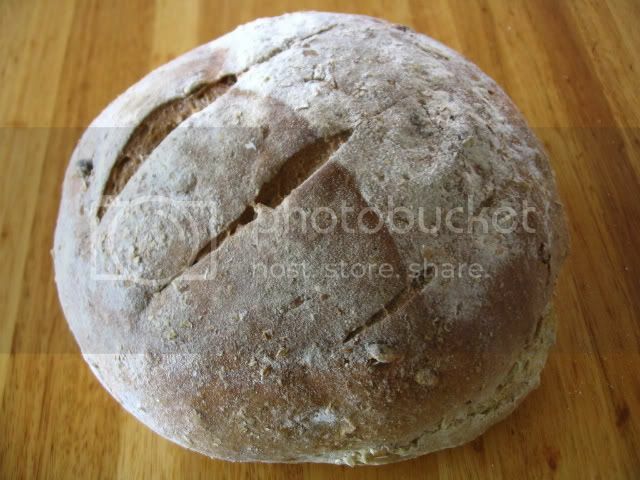 Back in the kitchen section, Yozza mixed his bread dough in a commercial mixer – enough for 28 loaves of 500gm each (pre-baked). This was my first glimpse of commercial baking. It struck me that the worlds of the professional and amateur baker are far apart – further than I had imagined. That gulf widened for me as the evening progressed. The obvious difference, of course, is one of scale. 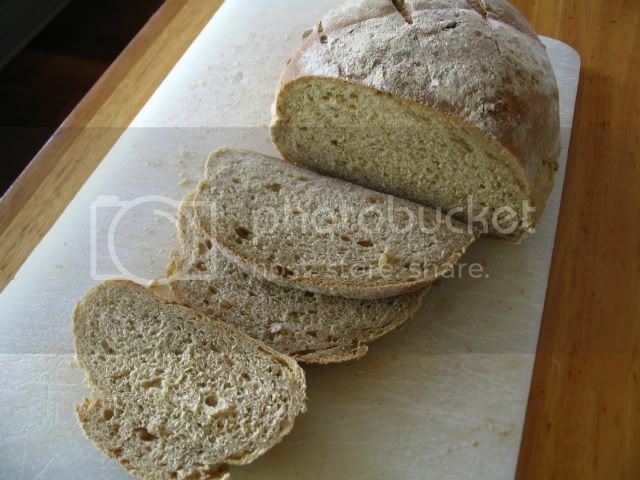 I keep my starter in the bottom of a small glass peanut butter jar in the fridge, and do a build for a single loaf of sourdough bread from a couple of teaspoonfuls, culminating in 2-300gm or so of active starter in a small glass mixing bowl. Yozza’s starter, by contrast, sits in a container about the size of a large can of paint! Mixing my bread dough, I add water out of a Brita filter jug, using a little plastic medicine-measuring cup to finish off to the nearest gram – Yozza pours in water by the bucket! When the proofing of the dough was complete, Yozza divided it into 500gm balls, which he pre-shaped with a deft motion I couldn’t easily replicate. That was nothing - his final shaping was so fast and tricky-looking, it seemed like sleight-of-hand! I tried to do a few loaves under his patient tutelage, but my efforts were clumsy and slow by comparison, and the results were as amateur as I felt! I was a bit taken aback, to be honest. Having carefully followed along with Hamelman’s directions when shaping my loaves at home, I thought I was on top of the shaping game. Uh uh. No time for my careful folds and finicky dough-nudging final shaping rituals when you’ve got 28 loaves to bake! And the pizzas? Well, I have to admit to a little disappointment. Perhaps unrealistically, I had expected the WFO to take my pizzas to dizzy new heights. I have arrived at my pizza dough over many months of tweaking and experimenting (see this post), and the pizzas I turn out of my domestic oven at home take some beating. The WFO did give a light airiness to the rim that can only be achieved with a fast rise driven by high heat, and added a nice char to the edge, but for some reason the overall flavour was not as good as that I achieve at home. Not by my reckoning, anyway. And Yozza’s bread? In a word, delicious! Soft elastic even crumb, thin but tasty crust, and lovely as open sandwiches for my lunch next day. Great spread with butter and honey, too – as you’d expect, the molasses and honey spoke eloquently to each other. All in all, a terrific insight into the commercial world of baking for me, and a rare chance to get up close and personal with a WFO. Many thanks to Yozza for making it all accessible to me. Following are a few pics taken during our bake-off. Not the best of quality – digital photography is not a strong point of mine – but it’s nice to have some visual record of the night, and to be able to share it here. Q: What beats a stoked-up wood fired oven ready to rock? A: A stoked-up WFO with pizza bakin' inside! My first wood-fired sourdough pizza margarita! Do I need to tell ya who's who? And yes, it IS as good as it looks! Nice to see TFL'rs getting together in REAL LIFE. That looks like a wonderful, delicious adventure! The pizza looks great from here- I think we tend to judge our own work too harshly sometimes. Delectable! And what a marvelous oven!!! Great story and photos, Ross! I loved reading about your adventure and how very nice to be able to get together and make a new friend through baking. You both look like your having a great time of it...thanks for sharing your story and photos. The pizza and loaves must have tasted wonderful out of the WFO. It looks like the oven was fired up good and hot for the pizza. The more pizzas you bake in a wfo the more you love them...if you thought it tasted the same as the home oven baked ones..I would have to say you were probably starved about the time it came out of the oven and ate it to fast... ; ) not that pizza out of the home ovens can't be awsome too! How long did you have to wait for the oven to stabilize before baking the loaves? Thanks for sharing, very nicely written up and the photos came out very good! The time between pulling the coals from the oven to loading the oven was about 30 minutes i guess, I couldnt locate our infra red thermometer so that Ross could get an idea of the temperatures, but i did give the oven floor a good scuffing with a damp teatowel on a broom stick that flicks out all the cinders and ash dust and does take a bit of the sting out of the oven, the other thing is that when you are filling the oven to full capacity the dough mass is also going to take a bit of heat too. With close to 10kgs of dough a fair amount of moisture is given up in the process 1.1litres in total to the cooled stage but probaly 750ml in the baking stage in steam and this will of course have a tempering effect on the fierce radiating heat with the door firmly closed on the opening. Re WFO pizzas: yeah, I am well familiar with the difference between these and domestic-oven-baked ones. You just can't beat a good WFO pizza, I'm sure you agree. My benchmark is the glorious pizzas I was fortunate enough to sample from the famous old WFO near the Trevi Fountain in Rome! Talk about making life hard for yourself...still, always good to have something lofty to aspire to! What a great post on a great evening, thankyou for coming thankyou for sharing, i made 13 pizzas for mothers day from my sourdough encouraged by your demonstration of your sourdough and technique. 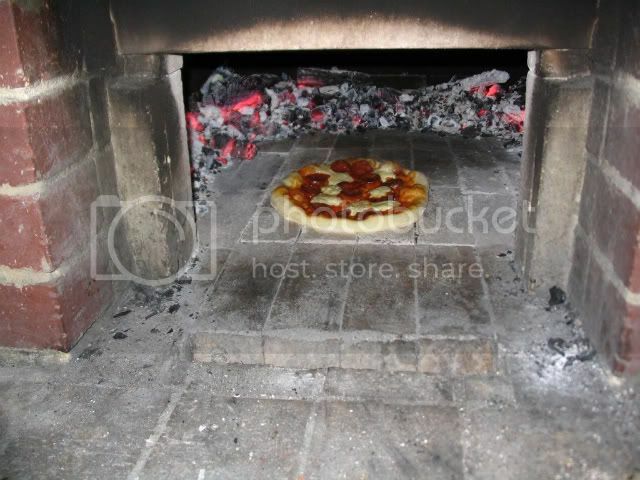 I used a wood fired oven that belonged to one of the relies, apparently the oven had only ever given up burt offerings in the past so you can imagine the delight when the pizzas were coming out close to perfect and everyone was getting involved and becoming experts in no time. Apparently the godfather because he was of Italian descent automaticly becomes the supremo and had the oven cranked like an incinerator with the same result. It was great meeting a fellow of the TFL family and an open invite to any other members of TFL that would like to join us next time for a future baking evening! Thanks for your kind words on my post, Yozza - and thanks again for making the night possible. Glad to hear the SD pizzas went so well! SD yields such great flavour in a pizza, doesn't it? And yeah, would be good to hear from any other Perth-based TFLers who might like to join us next time! That's one tasty looking pizza! Ross - Thanks for relating your adventure with your newfound baking pal. Sounds (and looks) like the two of you had a grand time! 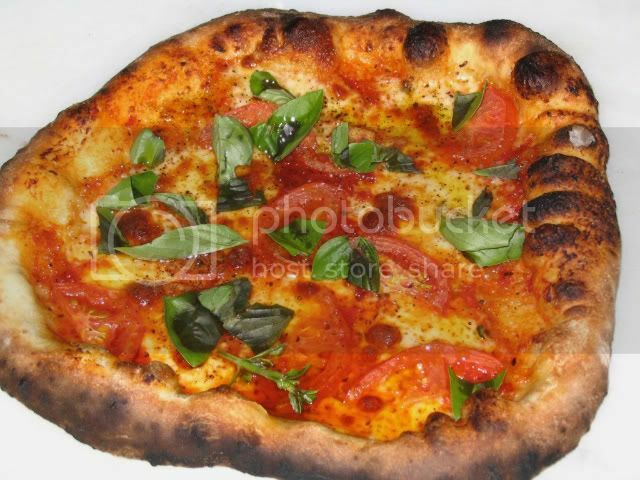 The pizza might not have lived up to your expectations, but the picture is mouth-watering! 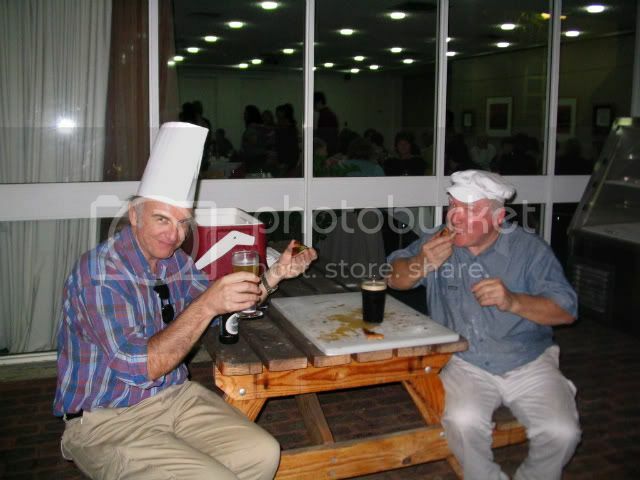 It is so good to see that photo of 2 happy bakers cracking a beer and sharing pizzas together. SD vs yeasted Hot Cross Buns - at last, a new winner...and it's vegan-friendly! Jiro Ono, sushi master - Gérard Rubaud's Japanese kindred spirit?